After three-straight seasons of 30-plus goals, Vincent Lecavalier pumped in 52 last season to win the Maurice “Rocket” Richard Trophy as the League’s leading goal-scorer. 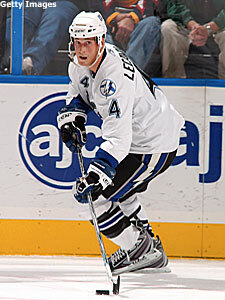 Vincent Lecavalier didn’t need to find a new strategy that would turn him into a standout NHL player. He already was that. The difference, though, between a standout player and a superstar is the superstar always seeks ways to tinker with his game and his approach. Tampa Bay’s veteran center found a way to do that last season, and the results have been staggering ever since. After three-straight seasons of 30-plus goals, Lecavalier pumped in 52 last season to win the Maurice “Rocket” Richard Trophy as the League’s leading goal-scorer. He already has 14 goals and 20 assists this season, which makes him the early front-runner for the Art Ross Trophy as the League’s top scorer, and puts him in the mix for the Hart Trophy as the League’s most valuable player. * He has registered multiple points in eight-straight games heading into Wednesday night’s game against the New York Rangers. The last such streak recorded in the NHL was in 1996 by Jaromir Jagr. 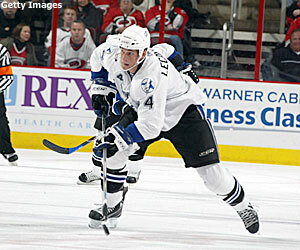 * On Monday Lecavalier was named the NHL’s First Star of the Week for the second-straight week. In the last eight games he has seven goals and 14 assists. Lecavalier has five goals and five assists in the last three games, including three goals and two assists and a plus-5 rating in a 6-1 win over Carolina last Wednesday. * Lecavalier has registered two or more points in 13 of the Lightning’s 20 games this season, including three or more three times. He has been held off the score sheet only four times. * After dropping its sixth-straight game to fall to 5-8-1 on Nov. 5, Tampa went on to win five in a row before a 4-3 overtime loss to Atlanta Monday night. The Lightning now are in second place in the Southeast Division, only five points behind Carolina. Lecavalier credited a lot of Tampa’s recent resurgence to goaltender Johan Holmqvist, who allowed only seven goals during the five-game win streak after letting in 21 in five of the six previous games, all losses. Lecavalier also made mention of defenseman Paul Ranger, who had scored in three-straight games until being blanked by the Thrashers Monday night; Tampa’s strong power play (it ranks fifth in the NHL); and linemates Martin St. Louis and Vaclav Prospal, who have 27 and 24 points, respectively. Lecavalier’s game is so coveted by scouts and hockey enthusiasts alike because he’s not all about the end result. All that, though, is just Lecavalier showing his modest side. Anyone who doesn’t realize Tampa goes as No. 4 goes either is being silly or isn’t a hockey fan. “If I was to start a hockey franchise and I had the first-pick overall, I’d take Vinny,” former NHL coach Pat Burns, who sees a lot of games in Tampa as a special assignment scout for the New Jersey Devils, told the St. Petersburg Times. Lecavalier’s game is so coveted by scouts and hockey enthusiasts alike because he’s not all about the end result. He has a mean streak in him, which he showed last month when he was issued fighting majors on back-to-back nights. He first dropped the gloves with Washington’s Shoane Morrisonn Oct. 24, and again with Philadelphia’s Scott Hartnell the next night. Lecavalier has fought 18 times in his nine-year career, but none last season. When it does happen, his teammates take notice.